Home > Spotlight news > Acting for Dean of Akkhraratchakumari Veterinary College , Walailak University attended the Workshop on ASEAN Veterinary Statutory Body Network’s Strategic Plans. Acting for Dean of Akkhraratchakumari Veterinary College , Walailak University attended the Workshop on ASEAN Veterinary Statutory Body Network’s Strategic Plans. Assist. Prof. Dr. Peerasak Sutthiyotin, Acting for Dean of Akkhraratchakumari Veterinary College, Walailak University and Assoc. 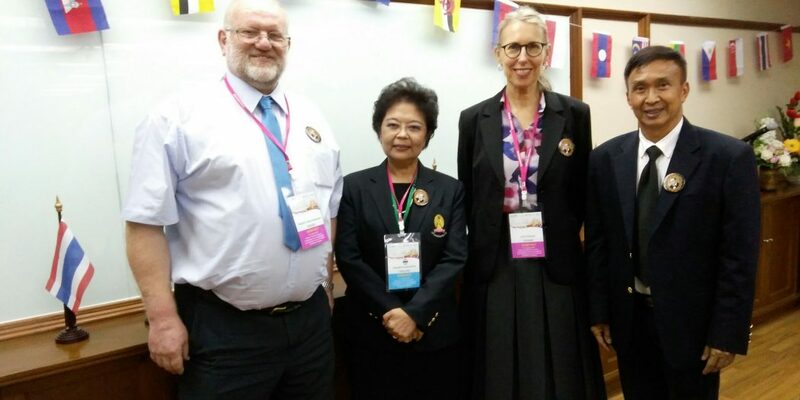 Prof. Dr. Saree Donkaewbua, lecturers attended the Workshop on ASEAN Veterinary Statutory Body Network’s Strategic Plans, 2018-2020, AVSEN 2017 meeting on 9-10 August 2017 at Faculty of Veterinary Science, Chulalongkorn University and Thai Veterinary Council. This meeting was focused on educational plan of universities in Asian region. The outcomes of this seminar were adopted for veterinary international course 2018 of Akkhraratchakumari Veterinary College, Walailak University corresponding with President Vision, Prof. Dr. Sombat Thamrongthanyawong. In addition, the Acting for Dean of Akkhraratchakumari Veterinary College was discussed with Dr. Julie Strous, Executive Director of Australian Veterinary Boards Council Inc. and Prof. Tim Parkinson, former dean of the Institute of Veterinary, Animal and Biomedical Sciences, Massey University, New Zealand for AVBC accreditation of Australia and further international collaboration, respectively. Previous “Basic ophthalmic diagnosis and basic ophthalmic surgery in small animals” by Dr. Ruangrat Buddhirongawatr (D.V.M., Ph.D), Faculty of Veterinary Science, Mahidol University on 19 October 2017 at Ravadee hotel, Nakhornsithammarat province.